CS-Cart Help Desk integrate UVdesk Help Desk system with your CS-Cart store with which you can let your customers visiting your store, the customer can raise the ticket for their concern and you can send them replies for the same and much more. An easy & effective interaction between Admin and Buyers. Store visitors or registered users can raise ticket relating to any concern/issue/ inquiry. Guest customers get registered automatically after raising the ticket. 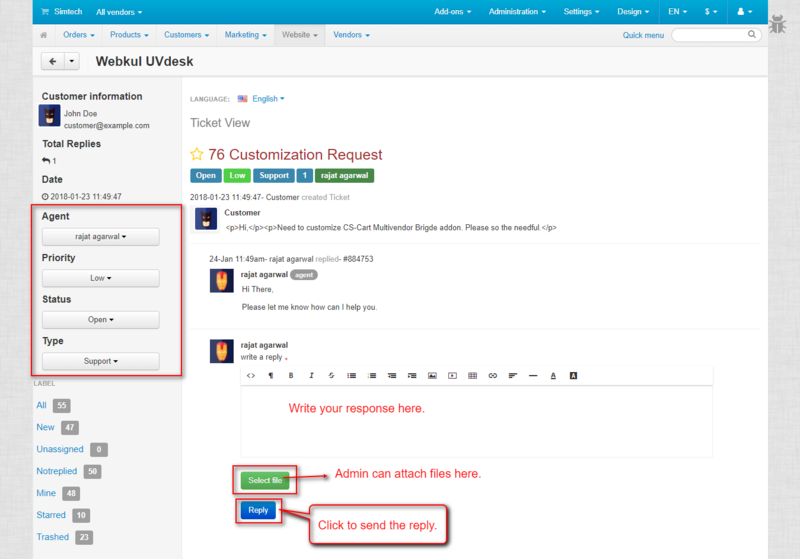 Customers can manage their tickets from the frontend. Store admin can manage all the tickets from the CS-Cart admin panel. Admin can reply to those tickets created by the buyer. Admin can assign an agent to the ticket who will look after the customer issue. Admin/Agent can create or delete or manage the tickets from CS-Cart backend as per the privilege assigned. Admin/Assigned agent/Customers can add attachments to ticket replies. The customer can add a collaborator to the ticket to keep the third party in the loop if needed. Use Upgraded UVdesk Plans to avail various other features. Improves customer retention and brand image. Which CS-Cart Add-Ons to use for customer support? UVdesk Helpdesk is one the premium CS-Cart Customer Support Add-Ons that you can use to provide customer service and improve customer experience. The customer can easily create tickets, you can assign the tickets to dedicated agents using workflows, create customised email templates and integrate more than 50+ apps comprising of social, marketplace, e-commerce etc. How to improve customer experience on CS-Cart? By providing help in real time and solving queries proactively, you can improve customer support experience on cs-cart. UVdesk helpdesk allows you to create workflows to assign queries to particular agents and solving them in minimum response time by creating SLA rules. Moreover, you can integrate 50+ apps into the platform to improve productivity. How to check tickets on cs-cart admin dashboard? When you install UVdesk help desk on your CS-Cart Store, the admin does not have to leave their store to UVdesk dashboard to check tickets every time. The ticket is available on CS-Cart admin dashboard and admin can perform actions like assigning to dedicated agents, filter tickets and seeing them by status. Can customer check tickets on their cs-cart account? Yes, when you install UVdesk Help Desk on your cs-cart store, the customer can check tickets on their account by logging into the cs-cart store using their credentials. The customer can even create ticket directly from there and do follow up on the created tickets. 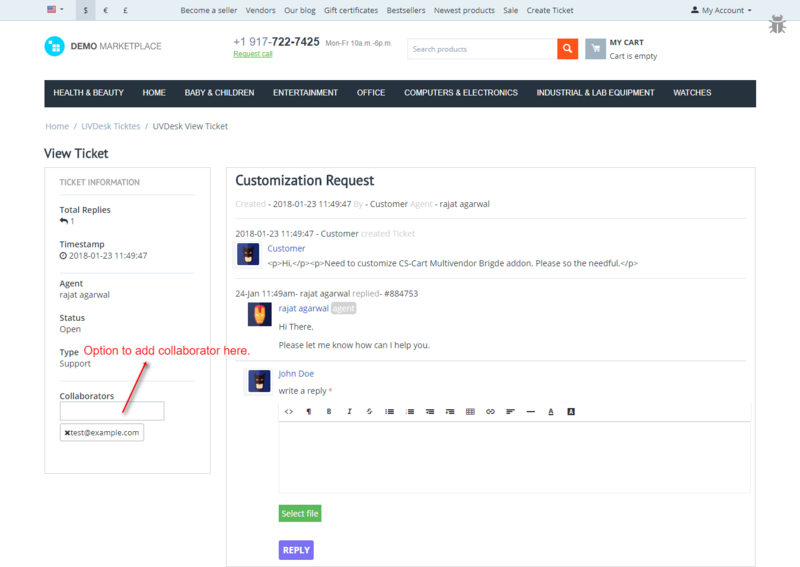 Is UVdesk help desk a free cs-cart help desk add-ons? Yes, you can install for free this cs-cart help desk add-on on your store. But you need to sign up to UVdesk to do the configuration. UVdesk comes with and basic plan that is free to use but limited usability and standard paid plans viz Pro and Enterprise.